Am I ready to hire someone? The first question you need to ask yourself is whether you are ready to hire someone to your one-man team or if you should continue to work alone. Typically, if you have begun asking this question, then the answer is likely to be yes. Rule of Thumb: If you are closing two deals per month, you need to hire a staff person. Once you get over 8 closings, you can begin adding other team members as needed, depending on your business model. Some team leaders feel that they should be working all kinds of crazy hours before they begin to let others onto their team. the truth is that if you are working more than 45 hours a week, then someone is suffering – your customers, your family, or your own health and well-being. What will the new hire do? Most team leads to not like / aren’t good at handling details. Instead, they prefer to be working with clients or negotiating deals or solving problems. That’s why you should hire someone that can do things like organize manage databases, and be sure all the T’s are crossed and the I’s are dotted. Doing so frees up your time to do what you are good at, and enjoy. Here is an interesting exercise to try to determine which specific tasks might make it onto your list. Download a timer app onto your computer. Set it to buzz every 15 minutes during your workday for a full week. Each time the buzzer goes off, write down a few sentences describing what you’ve done since the last buzzer sounded. When the week is up, highlight the income-producing tasks in green and the other tasks in yellow. 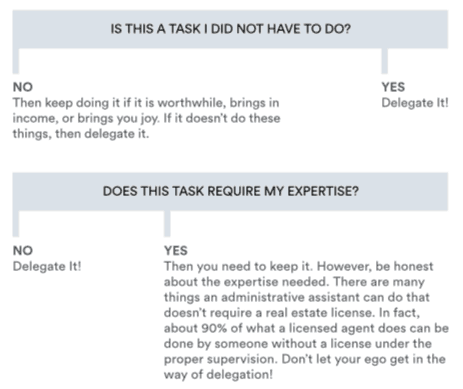 Delegate as many of the yellow tasks as possible because these tasks are of lower value than you are worth. This is a great way to decide what others can do for you as well as realize the time-wasting activities you become involved in during an average week. One thing to be aware of is your own ego. We all have the tendency to think we are the best at something and that no one can do it better than we can. If you have this attitude, then you will not be able to delegate without taking the job back and redoing it yourself. You know you have the right people if you are willing to let them be you. In other words, you will allow them to answer emails in your name, make phone calls for you, etc. If you don’t feel the need to check up on everything your new hire does or doesn’t feel the need to touch everything that leaves your office, then you have hired the right person. In terms of systems, you know you have the right systems if those you hire can do their jobs without having to come to you every step of the way. They should be able to do their jobs without having to come to you for signatures, okays, or signing off on details. The truth is that you won’t be able to grow your business if you feel that you must be involved in everything. RULE OF THUMB: Anything that someone else can do 80% as well as you OR 80% of the time OR 80% of the cost, you should delegate. Don’t let perfection stand in the way of action. This is always a huge concern, especially when hiring your first team member. In order to really answer this question, you first have to look at your own worth and then how much it would cost to hire someone to do the job. You should be spending as much of your day with billable time as possible and minimizing the time you spend doing marketing and administrative work. Keep in mind that marketing and administrative jobs are usually $14-$18/hour jobs. Your billable time should be much higher Most agents will make $100 or more per billable hour. What does this mean? It means that every time you engage in marketing or administrative work, you are losing money! Instead of making $100 or more an hour, you are making less than $20. Each hour worked is a loss of $80 or more. You cannot afford NOT to hire someone if your goal is to increase the time you spend on billable hour tasks. There are two main ways to hire someone for your team. They can be an employee or work on commission. Sometimes, you can combine a waged employee with bonuses or commission. Follow specific directions on how the work is to be done, what software to use, what the furnished product should be, etc. Although they have some autonomy, the final say is yours. Be assigned to specific tasks. A commissioned employee often works their own hours, but may still have specific assignments that need to be accomplished. But do be aware if you are giving them a cut of the commission cheque they must be licensed. Offering bonuses to waged employees is a great way to get them invested in the process. You should keep in mind that you aren’t paying $36,000 up front. In actuality, you’re only paying $3,000 per month (+ employee payroll costs). RULE OF THUMB: Gross commission grows relative to growth in expenses if you are expending the right things. If you find that hiring someone to do administrative work isn’t bringing in more revenue, then you either have hired the wrong person or have the wrong systems in place. If it is the wrong person, then you fire them and move forward with another hire. Random marketing gimmicks that have a recurring fee that you are not using, such as an old CRM database you haven’t let go of, more than one lead generation site, websites you no longer use, etc. Any lead generation site that does not bring in more leads than you could get if an administrative assistant freed up your time to get the leads yourself. If you are spending $1,000 to get 100 leads a month, but having an extra 20 hours a week means you can now get those leads on your own, you can cancel the lead generation and pay for half your assistant’s salary right there. When you determine to hire someone, they will free you up to do more work that brings in income. If they don’t, they should not work for you.